Chapter 1. What Is Leadership Capacity? When Jennifer Fielding decided to apply for a transfer to Belvedere Middle School,1 it was with good reason. With almost three years of teaching under her belt, she was beginning to feel a new sense of confidence. Not that she knew all there was to know about teaching—far from it—but she was ready to be more involved in work beyond the classroom. She found herself more concerned with children in other classrooms and families in the surrounding community, and she felt uncomfortable with the restrictions on the “talk” in the faculty room at her current school. This year, she had participated in the district curriculum committee and attended a middle school networking conversation. There she had met a few teachers from Belvedere Middle School. She was impressed. They talked with clear excitement about what was going on at Belvedere; they seemed to share an understanding about what they were trying to accomplish. Some of the reforms that she was reading about were beyond the talking stage at Belvedere. By mid-April, she had made her decision. When an opening in the social studies/language arts core occurred, she applied for a transfer. This is not an unfamiliar story. In many schools, momentum, energy, and growing commitment begin to form around some key improvement ideas; then a change in key personnel or mandated directions derails the effort. It is no wonder that veteran educators become discouraged and cynical and that new teachers leave the profession. How many times can you ride this merry-go-round before deciding to jump off? Ask any number of strong and seemingly effective principals what happened in the school that they just left. Many will reluctantly and sadly tell you, “The school went right back to the way it was before.” Well, that's not quite accurate. Schools and people never entirely return to the way they were before. Each time they rebound from a failed effort, they are more deeply disappointed, more cynical, more wounded. Each time, improvement in that school becomes more difficult to achieve. As long as improvement is dependent on a single person or a few people or outside directions and forces, it will fail. Schools, and the people in them, have a tendency to depend too much on a strong principal or other authority for direction and guidance. Any number of responses could now occur at Belvedere Middle School. A few key teachers could refuse to let their progress slip away and decide to take hold of the reins of reform and pull things back together. The new principal could be strong and wise and able to work with the school to recapture some of its previous momentum. The school could choose to envelop itself in regrets and remorse and let go of cherished innovations. In Chapter 4, you will discover in detail what happened at Belvedere Middle School. When Jennifer asked her powerful question, “What happened?” several teachers at Belvedere Middle School were enmeshed in self-pity. Those who had been tentative about the reforms were quick to point out how fragile the reforms were; those who had been somewhat resistant felt vindicated. Hadn't they warned that the school was moving too fast, with too many changes? Accustomed to looking to someone with formal authority to lead the way, the teacher analysts failed to recognize that leadership lies within the school, not just in the chair of the principal; that the school must build its own leadership capacity if it is to stay afloat, assume internal responsibility for reform, and maintain a momentum for self-renewal. The school would need a significant number of skillful teacher-leaders who understand the shared vision of the school and the full scope of the work underway, and who are able to carry them out. These teachers ideally would be involved in the selection and induction of the new principal. School staff would need to be committed to the central work of self-renewing schools. This work involves reflection, inquiry, conversations and focused action—professional behaviors that are an integral part of daily work. These conditions speak to two critical dimensions that we will explore in depth: (1) breadth of involvement and (2) understandings and skillfulness of those involved. Understandings and skillfulness involve more than knowledge of an innovation (e.g., a new curriculum program, schedule, or structural arrangement). The skillfulness addressed here consists of those skills of leadership that allow adults to capture the imagination of their colleagues, and that enable them to negotiate real changes in their own schools and to tackle the inevitable conflicts that arise from such courageous undertakings. 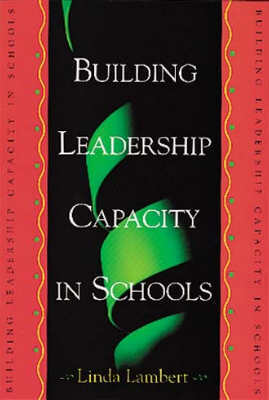 This book will explore in detail the meaning of and the strategies involved in building leadership capacity in schools. Before I address the concept of leadership capacity in detail, however, it is important to say more about what I mean by “leadership.” “Despite thousands of empirical studies yielding hundreds of definitions of leadership, there is still no consensus about it” (Evans, 1996, p. 116). One of the advantages about having no consensus on such a public idea as leadership is that the concept is still open for discussion. Most of us probably think of a particular person or set of behaviors when we think of leadership. When we use the word “leadership,” the next sentence often suggests what the principal, superintendent, or president did or did not do. “We have strong leadership in the school.” “We have weak leadership in this school, and we are clearly not going to achieve our goals.” “We need a change of leadership!” Each of these assertions refers to the principal. We generally consider leadership to be synonymous with a person in a position of formal authority. When we equate the powerful concept of leadership with the behaviors of one person, we are limiting the achievement of broad-based participation by a community or a society. School leadership needs to be a broad concept that is separated from person, role, and a discrete set of individual behaviors. It needs to be embedded in the school community as a whole. Such a broadening of the concept of leadership suggests shared responsibility for a shared purpose of community. When we equate “leadership” with “leader,” we are immersed in “trait theory”: If only a leader possessed these certain traits, we would have good leadership. This tendency has caused those who might have rolled up their sleeves and pitched in to help to abstain from the work of leadership, thereby abdicating both their responsibilities and their opportunities. Although leaders do perform acts of leadership, a separation of the concepts can allow us to reconceptualize leadership itself. Leadership needs to speak to a group broader than the individual leaders. This breadth can become more evident if we consider the connections or learning processes among individuals in a school community. This concept that I call “leadership” is broader than the sum total of its “leaders,” for it also involves an energy flow or synergy generated by those who choose to lead. Sometimes we think of our reactions to an energized environment as being caught up in the excitement and stimulation of an idea or a movement. It is this wave of energy and purpose that engages and pulls others into the work of leadership. This is what it is like to have a group of “leaders,” including, of course, the principal, engaged in improving a school. The key notion in this definition is that leadership is about learning together, and constructing meaning and knowledge collectively and collaboratively. It involves opportunities to surface and mediate perceptions, values, beliefs, information, and assumptions through continuing conversations; to inquire about and generate ideas together; to seek to reflect upon and make sense of work in the light of shared beliefs and new information; and to create actions that grow out of these new understandings. Such is the core of leadership. When the Fairview High School staff and community, working together, identified and clarified their values, beliefs, assumptions, and perceptions about what they wanted children to know and be able to do, an important next step was to discover which of these values and expectations were now being achieved. Such a discovery required that the staff and community members inquire into their own practice. What information do we have? What information do we need?2 The problems to be solved rested in the discrepancies: Is there a gap between our current practice and achievements and what we want children to be able to know and be able to do? These conversations clarified and framed the school's plans and actions for improvement. Further, these conversations also identified responsibilities and strategies for implementation and for continuous feedback that could be understood by the entire school community—not just the principal or the principal and one or two teachers. This is a difficult undertaking. Throughout this book I will describe the leadership dispositions, understandings, and skills that are essential if schools are to tackle such elegant and demanding work. Surface, clarify, and define community values, beliefs, assumptions, perceptions, and experiences. Fairview chose to use this process as a means to discover what they valued about student's learning (what students should know and be able to do). Such an effort requires many small and informal conversations as well as large-group work, in which staff surface and consider their personal schemas (what they already believe, think, and know). Fundamentally, learning is about clarifying and altering these personal schemas as shared beliefs and purpose are created and evolve. Inquire into practice. Discover or generate information (data) that could point to whether or not—and how well—students are learning in the desired ways. Fairveiw staff looked at student work, disaggregated test and participation data (e.g., attendance, suspensions), and a community profile. They formed collaborative action research teams to help them understand whether all students were learning equitably. Construct meaning and knowledge by comparing beliefs and expectations with the results of the inquiry. The “problem(s)” or issues to be considered reside in this discrepancy. In these conversations (involving both large and small groups), the Fairview community made sense of what was occurring with student learning in their school and more clearly identified the problems to be solved. They ultimately realized that three areas constituted major needs: improvement of student writing, understanding of science concepts, and development of skills in cooperative work. Frame action and develop implementation plans on the basis of the various conversations. At Fairview, the school staff, with active leadership from many teachers and the principal, decided to have a schoolwide research paper, to schedule field trips that emphasized the same environmental concepts, to teach all students the skills of cooperative learning, and to expand student involvement in decision making. The action plan included strategies for implementation, continuous feedback from inside and outside the school, and provisions for shared responsibility. This is where the rubber meets the road, so to speak; this is where broad-based responsibility for leadership work can be most critical. These processes are part of a repertoire of continuous learning interactions. Staff need to continually tie their work conversations to their shared purpose: “Now, what is it that we are trying to do here?” “Why is that?” Altering personal and collective schemas requires revisiting and reinterpreting ideas many times—in hallway conversations, informal small-group dialogue, lively faculty discussions, and quiet personal reflection as well as structured meetings. All of the learning must be embedded in a trusting environment in which relationships form a safety net of support and positive challenge (like a net under a high-wire walker). Especially in the beginning, people are taking risks. Because these processes occur among participants in a school community, it means that people are in relationship with one another. To be in authentic relationship means that we provide long-term support for one another, challenging one another to improve and to question our current perceptions, and to learn together. Attention to relationship is critical, for, just as in the classroom, “process is content” (Costa & Garmston, 1994). Not all learning processes constitute leadership. To be “leadership,” these processes must enable participants to learn themselves toward a shared sense of purpose—a purpose made real by the collaboration of committed adults. Leadership has direction and momentum, and it negotiates tough passages. It is this type of leadership we are seeking to build—the capacity to collectively learn ourselves toward purposeful action so that a school community can keep moving when current leaders leave—whether the leaders are two teachers, a principal, or a powerful parent. Leadership is not trait theory; leadership and leader are not the same. Leadership can mean (and does mean in this context) the reciprocal learning processes that enable participants to construct and negotiate meanings leading to a shared purpose of schooling. Leadership is about learning that leads to constructive change. Learning is among participants and therefore occurs collectively. Learning has direction toward a shared purpose. Everyone has the potential and right to work as a leader. Leading is skilled and complicated work that every member of the school community can learn. Democracy clearly defines the rights of individuals to actively participate in the decisions that affect their lives. Leading is a shared endeavor, the foundation for the democratization of schools. School change is a collective endeavor; therefore, people do this most effectively in the presence of others. The learning journey must be shared; otherwise, shared purpose and action are never achieved. Leadership requires the redistribution of power and authority. Shared learning, purpose, action, and responsibility demand the realignment of power and authority. Districts and principals need to explicitly release authority, and staff need to learn how to enhance personal power and informal authority (for a fuller examination of this notion, see Lambert, Kent, Richert, Collay, & Dietz, 1997, pp. 122–143). Together, these assumptions advance the ideas that I believe are essential if we are to develop sustainable, self-renewing schools. 1 Belvedere Middle School, Arabesque Elementary School, Capricorn High School, and Fairview High School (and the names of staff members) are all pseudonyms. 2 For a thorough discussion of the inquiry process, see Sagor, 1992; Glickman, 1993; Calhoun, 1994.